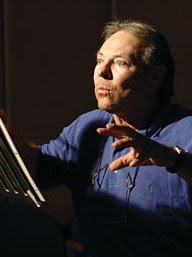 Frank Welker, my real name is. Responsible for the voices in many cartoons such as Scooby- Doo and The Simpsons (santa's little helper), I am. Like Yoda I look. Yeesssssss. Frank is indeed a very cool guy. The list of cartoons/movies he's provided the voices for is incredible. 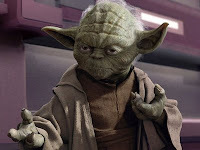 Looking like Yoda (well in this photo anyway) and using the force can only add to his coolness, just hope he used it wisely. Read more about Frank Welker's awesomeness here.